To search our catalogue please select from the options below. If you would like further information please contact us. The 400 Series SilcoNert 1020 coated regulators are intended for primary pressure control of reactive or corrosive calibration mixtures or pure gases in applications where an extreme inert wetted finish is required. The proprietary non-reactive amorphous silicon finish is desired over standard 316L stainless steel and ideally suited for H2S, reduced sulphur, mercury and PPM to PPB calibration mixtures. Key Features – Single Stage, SilcoNert 1020 Coated Body/Diaphragm/Internals, 316L Stainless Steel Barstock Body, Six Port Configuration, Inert Surface Finish and Corrosive Resistance. Typical Applications – Reactive calibration standards, emission monitoring, H2S PPM to PPB standards, Mercury standards, Sulphur mixtures and Corrosive service. Key Features – Dual Stage, SilcoNert 1020 Coated Body/Diaphragm/Internals, 316L Stainless Steel Barstock Body, Six Port Configuration, Inert Surface Finish and Corrosive Resistance. Key Features – Single Stage, Electroless Nickel-Plated Forged Body and Corrosive Resistance. Typical Applications – Hydrogen Chloride, Chlorine, Boron trichloride, Hydrogen bromide, Hydrogen sulphide and Dichlorosilane. Please contact us for a quote or if you have any questions. 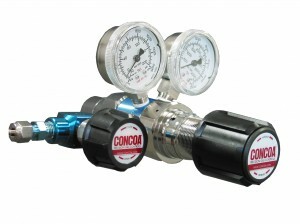 The 430 Series SilcoNert 1020 coated regulators are intended for pressure control of reactive or corrosive calibration mixtures or pure gases in applications where an extreme inert wetted finish is required along with stable delivery pressure regardless of inlet pressure. The proprietary non-reactive amorphous Silicon finish is desired over standard 316L stainless steel and ideally suited for H2S, reduced Sulfur, Mercury and PPM to PPB calibration mixtures. Need some more information about isotopes, special gases or gas equipment?